Great for a night out. Was no hassle to get into late at night. All the staff I encountered were lovely. 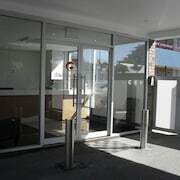 I'll stay elsewhere in Wollongong Spacious apartment but very outdated.& not very clean. Breakfast could have been better. Stay was nice, waking up and enjoying breakfast sitting on the balcony with ocean views as well as the golf course. Needs work Ok stay, but the price didn’t match the outdated decor and the lack of facilities. The car park area could do with a spruce up, it looks terrible. Location was excellent. 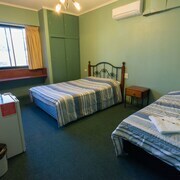 Staff were friendly but rooms need to be bulldozed. 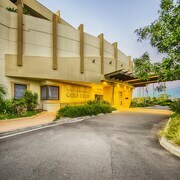 Staff are friendly and super helpfu Great Hotel! Staff really make you feel welcome. Rooms are basic, clean and quite spacious. Only thing, maybe add some greenery to the room. Artificial plants look quite realistic these days. Adding these will breathe life into the rooms, especially if your room overlooks the car park. Just like smashed avo and binge-watching your fave TV shows, travel is up there with the best things in life. And if your adventures take you to Wollongong, you'll discover a seriously epic range of hotels to pick from. 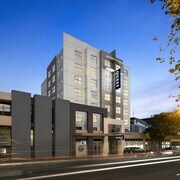 You'll discover 22 hotels within a 5-kilometre radius of downtown Wollongong on lastminute.com.au. Choice AND convenience? Winning! Keen to have it large around town? You won't get much more central than the Mantra Wollongong and the Sage Hotel Wollongong! 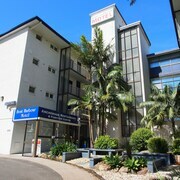 The Novotel Wollongong Northbeach and the Best Western City Sands are also well worth checking out. Take a squiz at Breakwater Lighthouse, which guided sailors and their passengers through unpredictable waters. 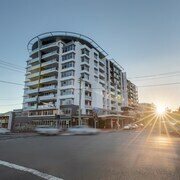 Adina Apartment Hotel Wollongong and Marketview are two convenient options if you and the squad are wanting to stay nearby. History buffs, will enjoy spending time at Flagstaff Hill Fort. 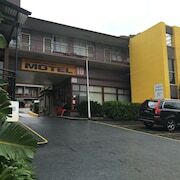 If you want to hit the hay after you've been there, the closest hotel options are the Boat Harbour Motel and City Beach Motel. You might also like to try The Sebel Harbourside Kiama, which is situtated 25 kilometres away. 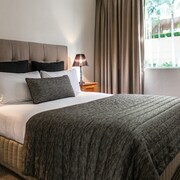 Or you might like the Quality Suites Pioneer Sands, just a distance of 4 kilometres from Wollongong. The Shellharbour Resort, 17 kilometres away, and the Kiama Shores Motel, 25 kilometres away, are some further alternatives. It's well known that Aussies are pretty laid back, so consider hanging round a little longer and checking out the Australia's Industry World and the Port Kembla Golf Club in Windang, 11 kilometres to the south of Wollongong. If you'd like to spend a night or two in Windang, consider the Windang Beach Tourist Park and Lake Illawarra Bed and Breakfast. 25 kilometres to the south of Wollongong you'll find Minnamurra, home to the Kiama Harbour Cabins and Kiama Cove Boutique Motel. While in Minnamurra, don't miss Kiama Blowhole and the Pilots Cottage Museum. After being squashed in a cabin seat for hours, a seriously cosy bed at the Rydges Sydney Airport Hotel will feel heavenly! If it's chockers there, check out the Mercure Sydney International Airport. Both are super close to Kingsford Smith International Airport, which is 60 kilometres from the centre of town.